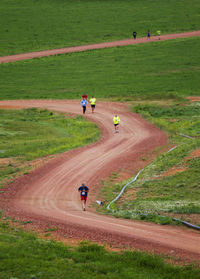 17th Annual Durham Ranch Charity Buffalo Stampede 5K/10K Walk-Run, held on Saturday, June 2nd. 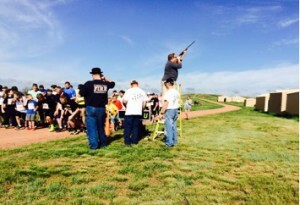 The popular annual charity event raised over $30,000. All proceeds went to the Powder River Energy Foundation, serving those in need of northeast Wyoming with a hand up. The weather cooperated for big, sunny skies and a light, cool breeze for the walk/run. There was a great turnout with around 180 in attendance. Overall women’s and men’s race champions for both distances took home one of a kind, hand-made clay medallions with bison leather straps by Deb Penning of Baker City, OR., an assortment of Durham Ranch buffalo meat and, gift certificates for the Open Range Restaurant in Wright, as prizes. After the famous buffalo burrito breakfast served up by Hank’s of Wright, the events were capped off by the traditional annual Buffalo Chip Toss where the women’s and men’s champions each took home a case of Durham Ranch buffalo brats. Arrow Langston, a school teacher from Wright who happened to be celebrating her birthday, won the toss for the women and, Scotty Hayden made the best toss for the men. 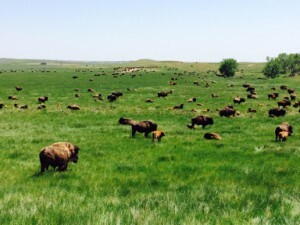 The 16th Annual Charity Event will be held at the Durham Bison Ranch on June 3rd, 2017. Registration is now open and you can get your registration form here. 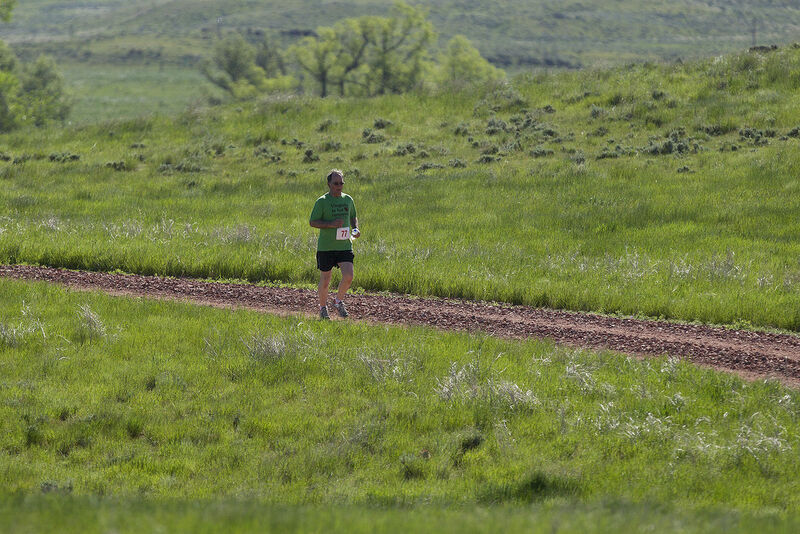 In addition to the 5K/10K walk/run event, there are lots of other fun activities for the day. Breakfast is always delicious and the chip tossing competition is sure to bring a laugh and a smile! 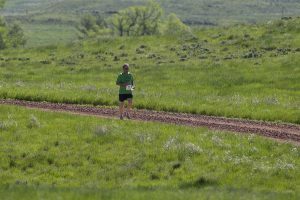 100% of revenue goes to a local charity, and this year’s proceeds will go to the Powder River Energy Foundation. 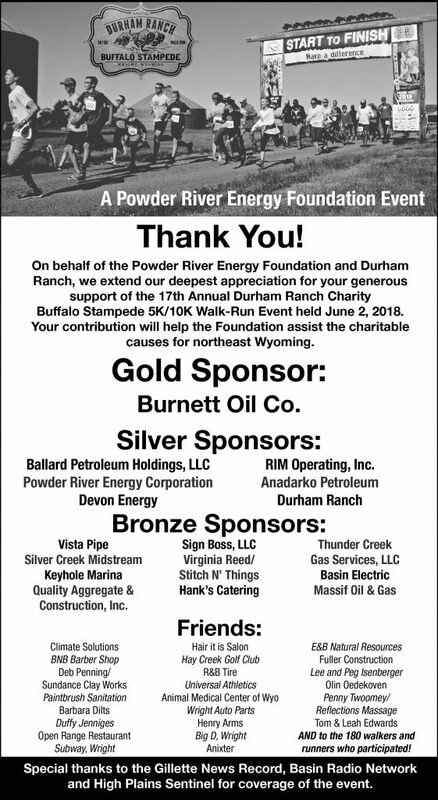 Established a decade ago, the Powder River Energy Foundation has awarded more than $250,000 to scores of organizations in every county of PRECorp’s service territory of northeast Wyoming. 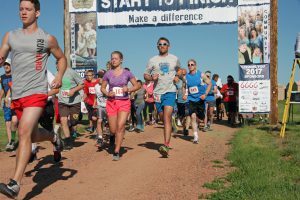 The Foundation’s main focus has been to support local organizations with limited resources for funding such as food pantries, veterans’ groups, rural health care, and youth education. All proceeds stay local to our area. If you have ever wanted to be the presenter of one of those “large checks” become a sponsor! That opportunity is open for gold level sponsors of the event. For more details on how you can become a sponsor and receive local recognition for supporting the community, click here. We hope to see you on the dirt on June 3rd! This recipe was submitted from one of our loyal customers and friends here at the ranch. Simple and Delicious… what could be better?! Enjoy… ! 1/2 pound of ground pork. 2/3 cup of bread crumbs. 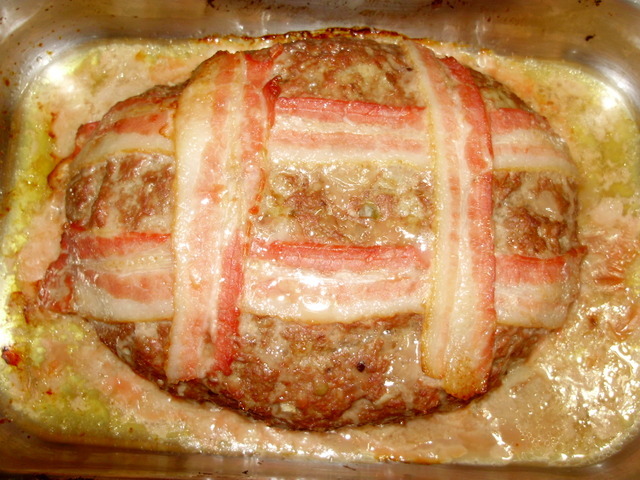 2 or 3 strips of bacon. 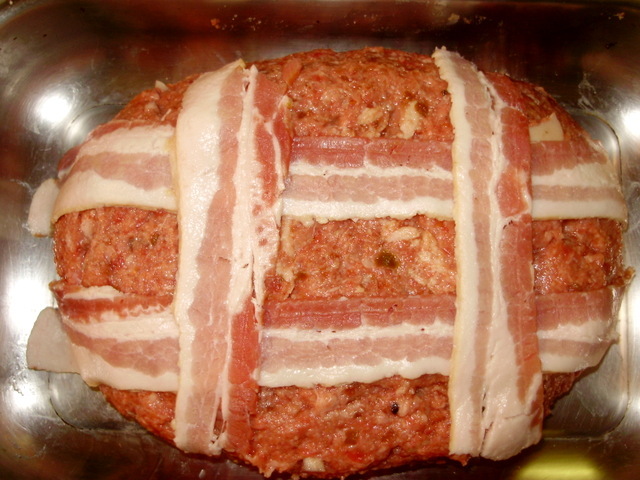 Put all the ingredients (EXCEPT THE BACON STRIPS) in a large mixing bowl and mix very well. Then place the mixture in a pan, form into a loaf and place the bacon strips on top. 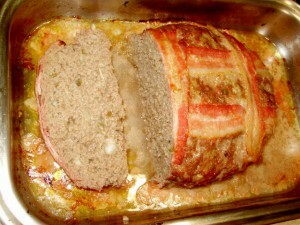 Set the oven temp to 350 degrees and bake from 60 minutes to 75 minutes depending upon how thick you make the loaf. We have officially entered our “busy season” here at the Durham Ranch! And this year, once again, we are so fortunate to have some special help to keep us on top things. Molly Shea, a 3rd year Humboldt State Wildlife Biology major, is here for her second year as an intern for the ranch. She happens to be a cousin of mine that has been to the ranch many times with her mom (my first cousin Lori) while she was growing up. I have asked Molly to write this version of our Durham Ranch Update so, you are in for a treat. It’s Summer, with the sun beaming down and hay growing in the fields we couldn’t be happier! 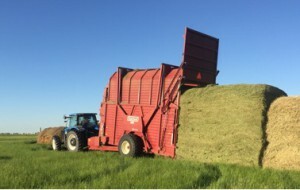 Haying began in June with everyone in their usual places – Bud on the swather, Jeff on the rake, and Pat & John on the stacker. About a day after starting, we got a HUGE thunderstorm! Like the kind that wake you up at night and keep you up, mesmerized by the strobe flashes of lightning until you can no longer keep your eyes open. Stopped us right in our tracks for haying but luckily, the weather was sunny and warm afterwards, allowing us to start back up again. Here’s a picture of John on the stacker, dropping off one of the giant hay bales (or loaves, as I like to call them). 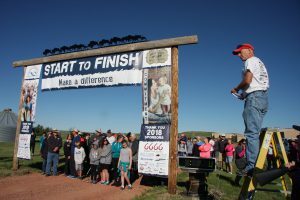 At the beginning of June, we had our annual 5k/10k walk/run on the ranch with all the donations going to Blessings in a Backpack, an organization that helps feed low-income children on the weekends and after school. With the support of many businesses and local donors, we raised nearly $50,000 worth of in-kind and direct donations, enough to fund their organization for an entire year! 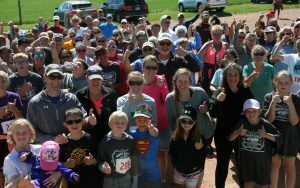 Plus, we had around 160 folks come out and participate in this year’s event as well! I don’t know about you, but I’d call that a success! We’ve resumed our tours, booked through the Gillette and Wright Visitor’s Centers, giving people a brief history of the ranch, a walk-through of the corrals, some encounters with local wildlife, like pronghorns and mule deer, and a chance to get up close and personal with the bison (but at a sensible distance, of course). Tours are my favorite part of being an intern because you get to share such a special experience with someone who may have never seen a bison before! It’s pretty fun to see their ‘ooh-ing’ and ‘ahh-ing’ once we get near the herd. It’s an incredible sight to see, especially with the grass being so green! Finally, my big project. 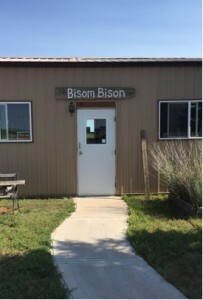 The gift shop, “Bisom Bison”. It’s been a real whirlwind of inventory, spreadsheets and technology – but a good opportunity to get the ranch up and running in the 21st century! We’ve gotten all kinds of new items in the store like Wyoming souvenirs and bison horn jewelry, made by John’s daughter, Cari! It’s really coming along and if you haven’t been yet, I highly recommend stopping by! 🙂 If you’re more than a hop, skip, and a jump away, check out our Facebook page at www.facebook.com/durhambison!